Under ideal circumstances (left panel), tumor cells and their antigens are picked up by immune cells such as dendritic cells (DC), which in turn instruct T cells (T) to proliferate and eliminate the tumor cells. 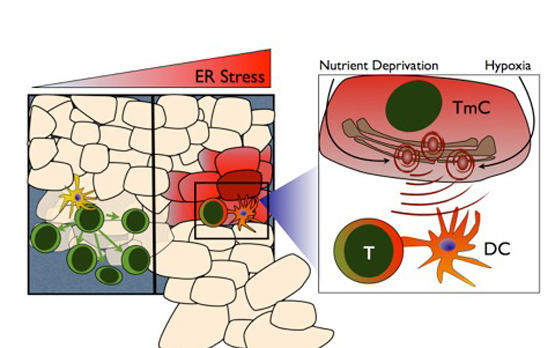 A different scenario (center panel and right insert) occurs in the growing tumor where tumor micro-environmental factors such as nutrient deprivation or hypoxia create ER stress in tumor cells (TmC). These stressors induce an unfolded protein response (UPR) in tumor cells, which is then transmitted to nearby DC and brainwashes them. Affected dendritic cells no longer coordinate T cells, and impaired T cells no longer proliferate. This inappropriate T cell education hinders the effect of the body’s anti-tumor immune response and allows for unrestrained tumor growth. Researchers at the University of California, San Diego School of Medicine report that tumor cells use stress signals to subvert responding immune cells, exploiting them to actually boost conditions beneficial to cancer growth. The findings are published in the December 18 online issue of the journal PLOS ONE. Lead author Navin R. Mahadevan, a graduate student in the Laboratory of Immunology at the UC San Diego Moores Cancer Center, and colleagues found that tumor cells manipulate a fundamental cellular mechanism called unfolded protein response (UPR). In all cells, UPR is used to maintain homeostasis, or equilibrium, in the endoplasmic reticulum (ER) – the cell’s protein-making factory. When, for a variety of reasons, a cell is subjected to overwork, ER stress occurs and a compensatory UPR is triggered. “The goal is to understand how ER stress is transmitted and how this is amplified by receiver cells to attack vulnerable aspects of the immune system,” said principal investigator Maurizio Zanetti, MD, who heads the Laboratory of Immunology and is director of Tumor Immunology at the Center for Immunity, Infection and Inflammation at UC San Diego. When a UPR response is triggered, one of two things can happen. Either UPR restores homeostasis by slowing cellular processes and synthesizing chaperone molecules to ease the burden on the endoplasmic reticulum or it decides homeostasis can’t be restored and the cell is better off dying. The latter is called apoptosis, or programmed cell death. In research published last year, Zanetti and colleagues found that the UPR is transmissible: It can travel from one cell to another. In normal cells, ER stress is transient with the UPR usually restoring normal function. But cancer cells thrive in an environment in which low oxygen and scarce nutrients, such as glucose, induce continuous ER stress. For them, a sustained ER stress response “offers a survival advantage by promoting cancer cell adaptation, continued growth, and inflammation that is more damaging than healing,” Zanetti said. In the latest study, the scientists found that the transmissible ER stress response (TERS), which emanates from tumor cells experiencing ER stress, alters immune cells in such a way that they no longer function to help fight off cancer. Normally dendritic cells – the sentinels and information couriers of the immune system – train T cells (the immune system’s enforcers) to specifically kill foreign entities. In the case of cancer, however, T cells are unable to properly eliminate tumor cells – confounding efforts to develop more effective cancer treatments. The new findings implicate TERS as cancer’s siren call. It brainwashes dendritic cells so that they ineffectively communicate with T cells, reducing anti-tumor immunity while increasing tumor growth. Zanetti said the research further elucidates the fundamental processes that tumor cells use – or abuse – to manipulate their local microenvironment to promote their survival and growth. And it points to an area of drug development the pharmaceutical industry will likely focus on over the next decade. Targeting the UPR, he said, may also help improve efficacy of long-sought cancer vaccines which have thus far been hampered by the ability of cancer cells to subvert the immune response, perhaps through mechanisms like TERS. Co-authors are Veronika Anufreichik, Jeffrey J. Rodvold and Kevin T. Chiu, UCSD; and Homero Sepulveda, BD Biosciences, San Diego.